Barbara Lea's taste and integrity and uncompromising standards, along with her devotion to lyrics and her deep musicality, have made her one of the most widely respected and admired interpreters of the classic American popular song. Born into a musical family in Detroit, she worked with small dance bands there before attending Wellesley College on scholarship and majoring in music theory. 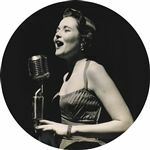 Boston was a hotbed of jazz in the late 40s and early 50s, allowing Barbara to sing with major instrumentalists such as Marian McPartland, Bobby Hackett, Vic Dickenson, Frankie Newton, Johnny Windhurst, and George Wein. At the same time, she sang in the college choir, worked on the campus radio station and newspaper, and arranged for and conducted the Madrigal Group and brass choir concerts. Her professional career started upon graduation. Her early recordings for Riverside and Prestige met with immediate critical acclaim and led to her winning the DownBeat International Critics' Poll as the Best New Singer of 1956. She appeared in small clubs in New York, including the renowned Village Vanguard, and throughout the eastern U.S. and Canada, as well as on radio and TV. She studied acting to improve her stage presence and, with the near-demise of classic pop in the early 60s, turned to the legitimate theatre, performing an impressive list of leading and feature roles in everything from Shakespeare to Sondheim. She moved to the West Coast and received her M.A. in drama at Cal. State-Northridge, then returned to New York and taught speech at the American Academy of Dramatic Art and acting at Hofstra College. In the 1970s, with the resurgence of interest in show tunes and popular standards, Barbara Lea was literally sought out to appear in the Peabody Award-winning National Public Radio series "American Popular Song with Alec Wilder and Friends". This led to two lengthy feature articles in The New Yorker (where Whitney Balliett declared "Barbara Lea has no superior among popular singers") and a renewed singing career.